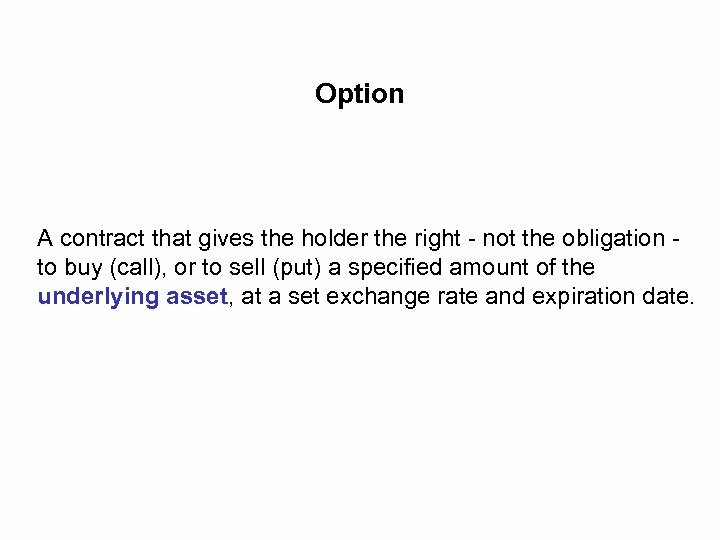 Option A contract that gives the holder the right - not the obligation - to buy (call), or to sell (put) a specified amount of the underlying asset, at a set exchange rate and expiration date. 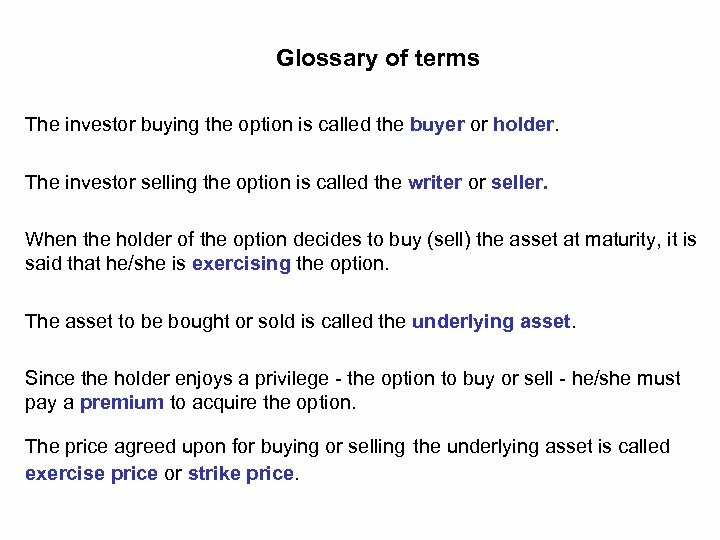 Glossary of terms The investor buying the option is called the buyer or holder. 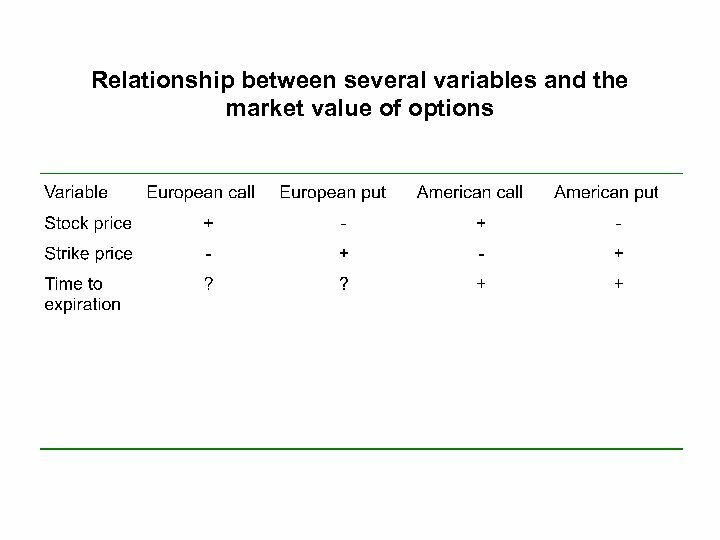 The investor selling the option is called the writer or seller. 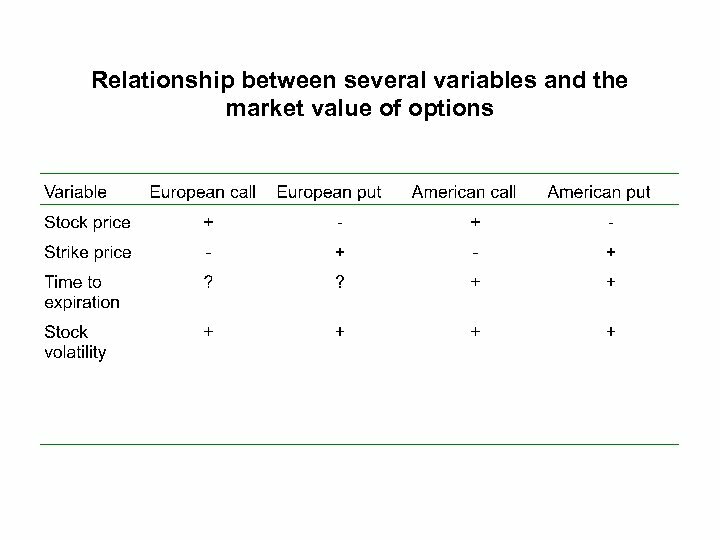 When the holder of the option decides to buy (sell) the asset at maturity, it is said that he/she is exercising the option. The asset to be bought or sold is called the underlying asset. 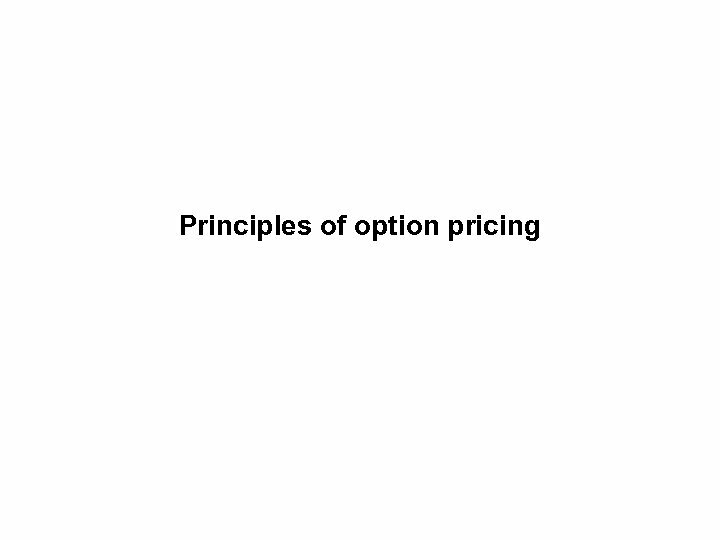 Since the holder enjoys a privilege - the option to buy or sell - he/she must pay a premium to acquire the option. 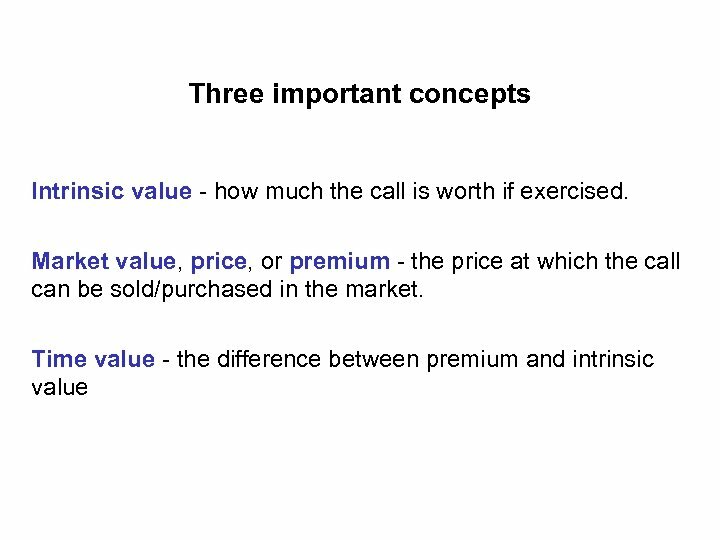 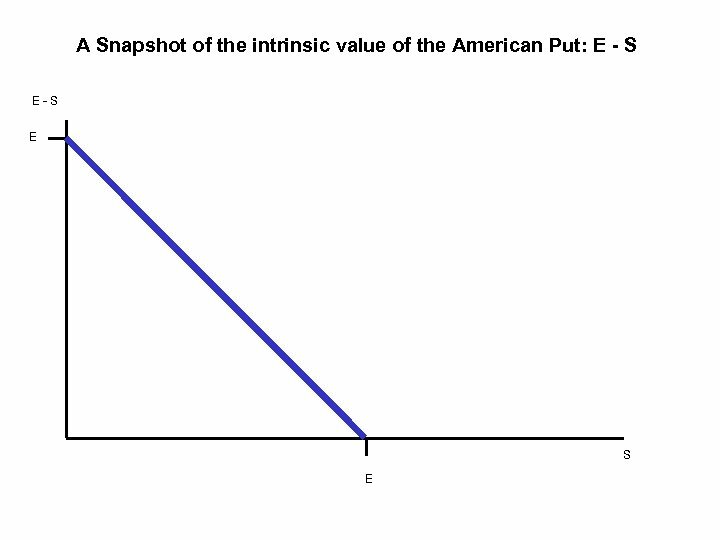 The price agreed upon for buying or selling the underlying asset is called exercise price or strike price. 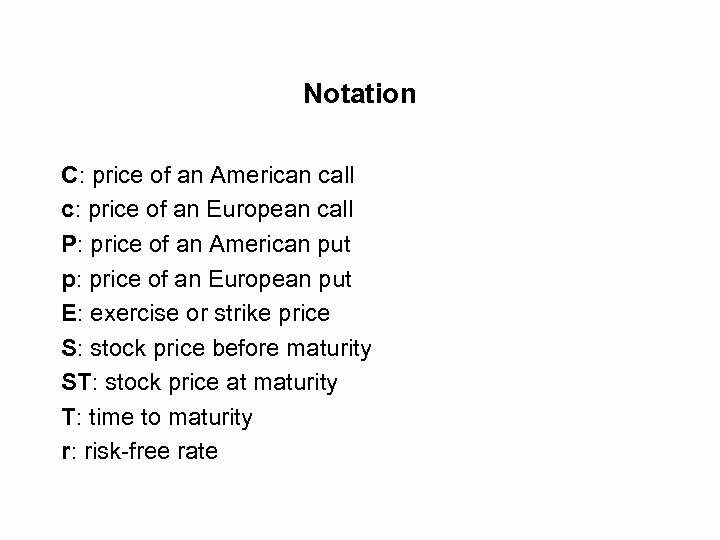 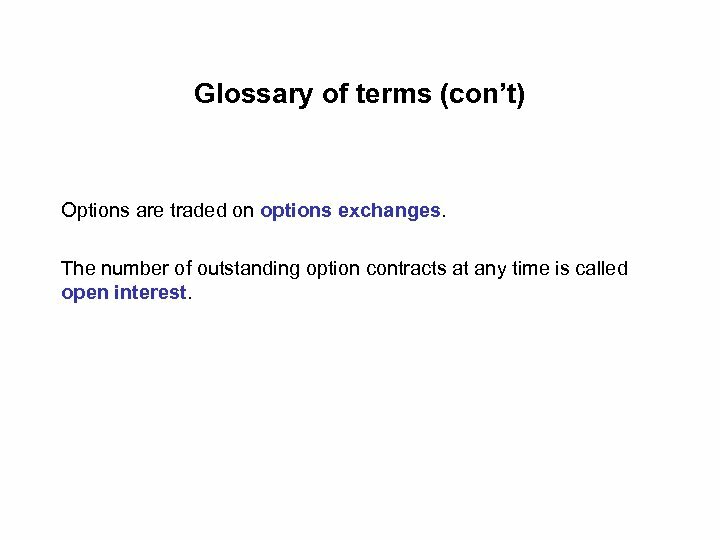 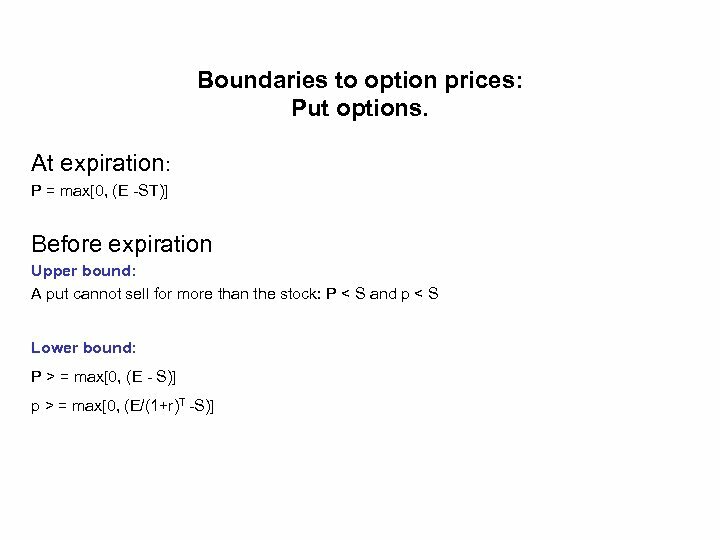 Glossary of terms (con’t) Options are traded on options exchanges. 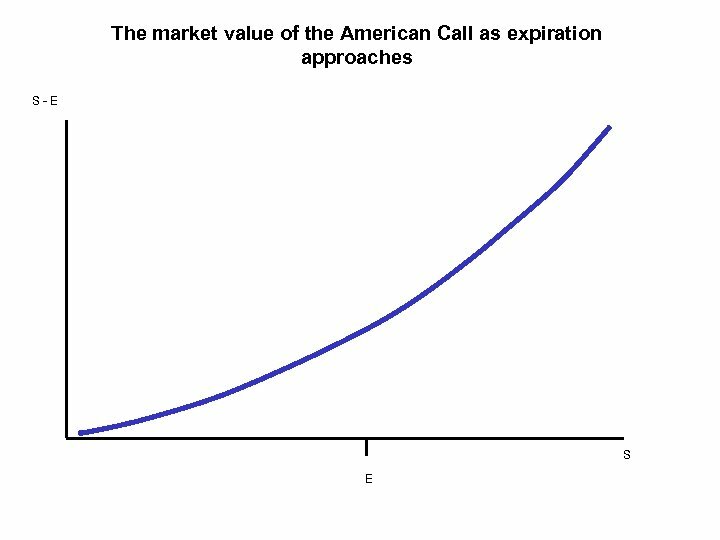 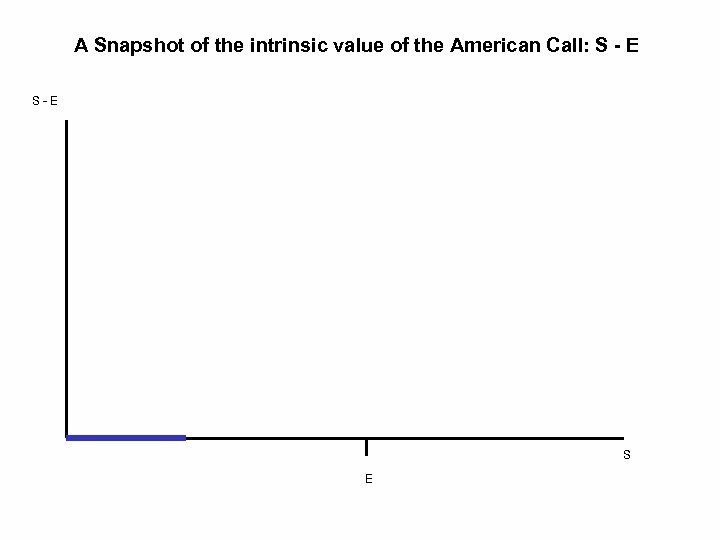 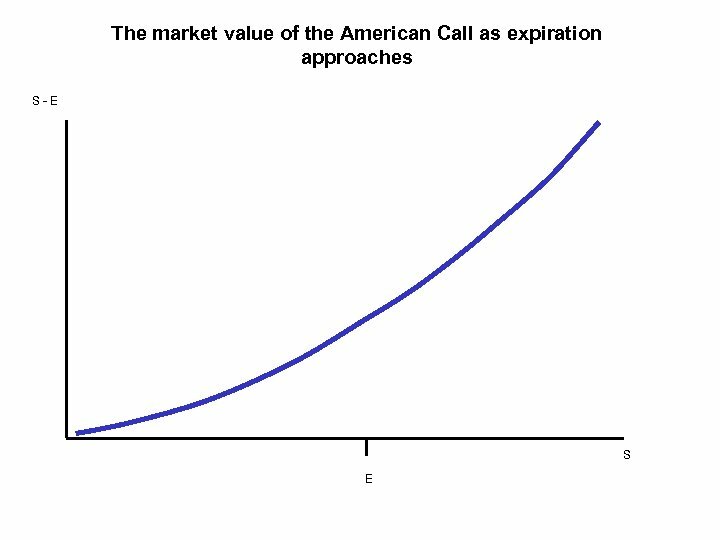 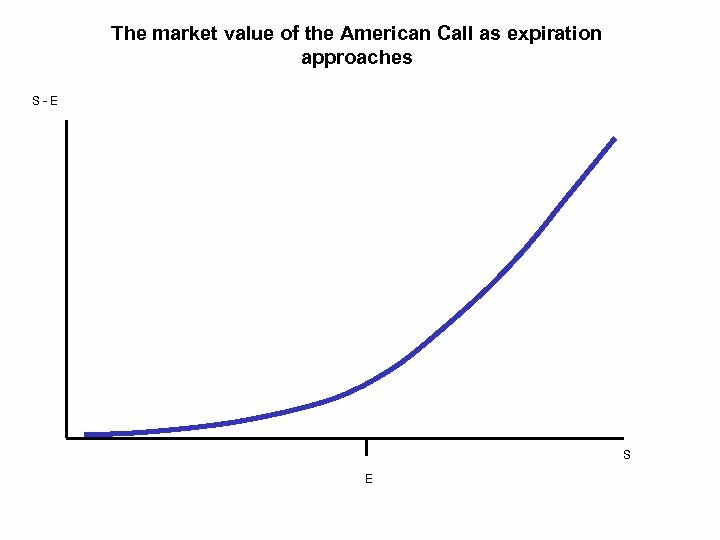 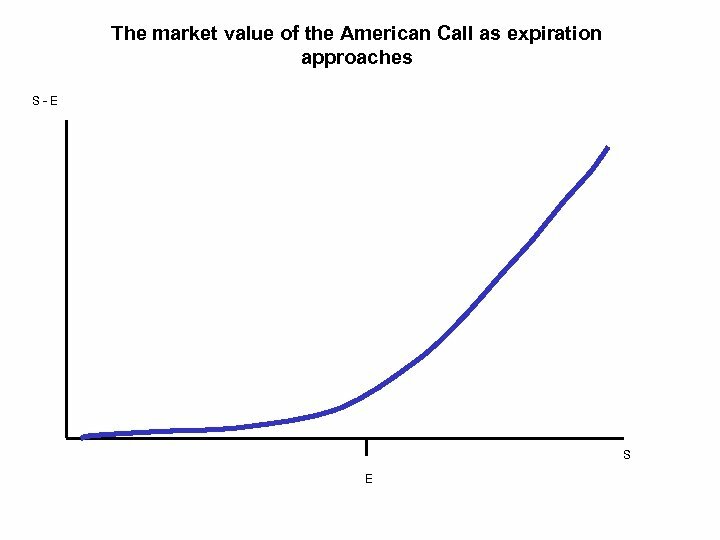 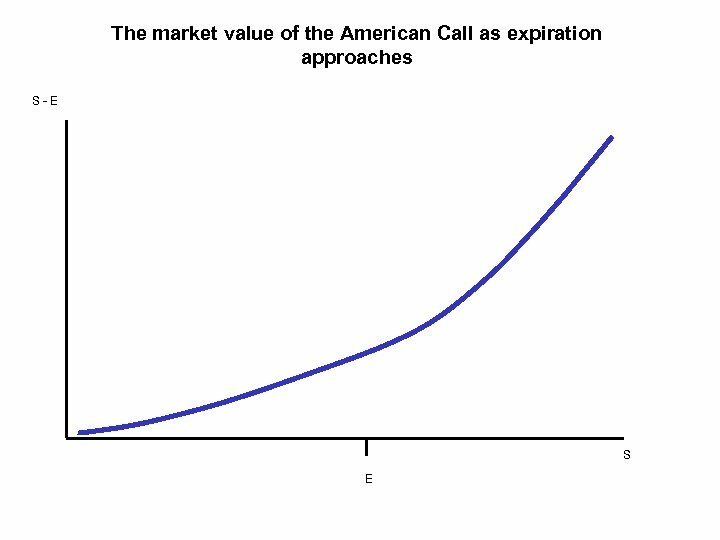 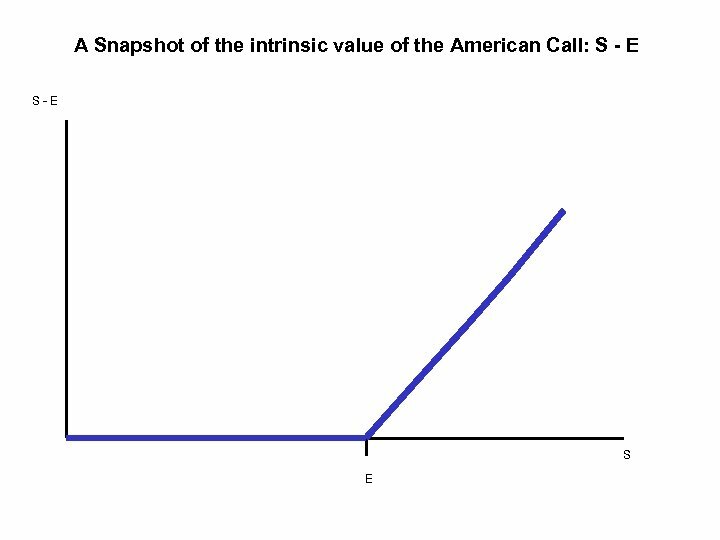 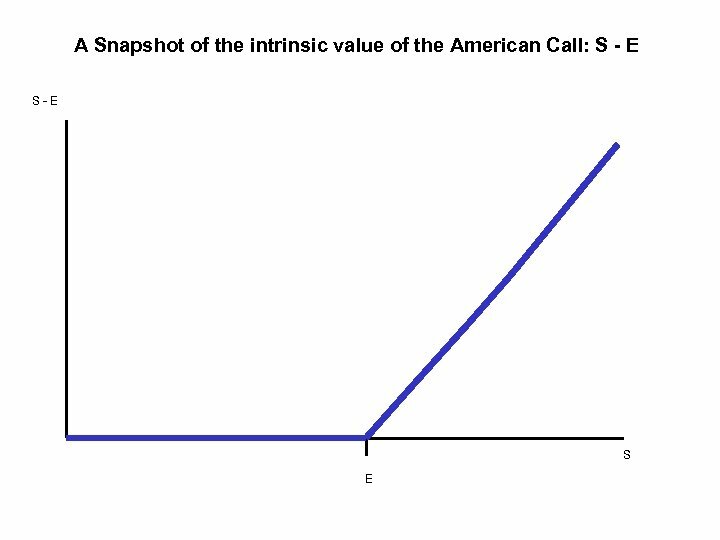 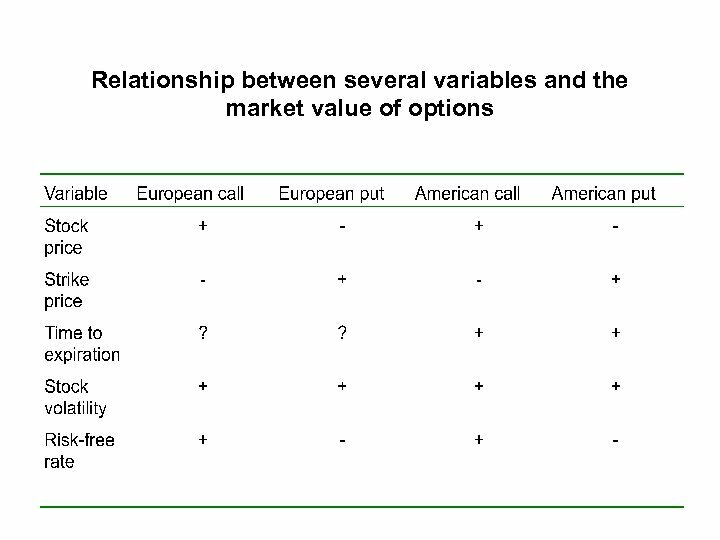 The number of outstanding option contracts at any time is called open interest. 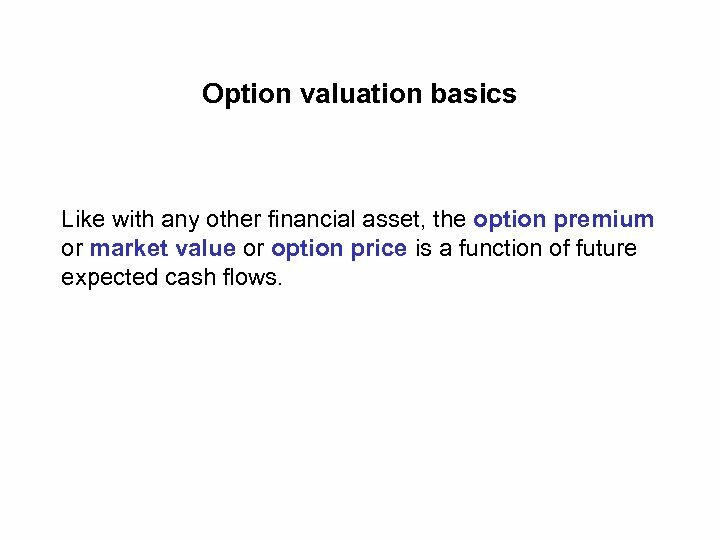 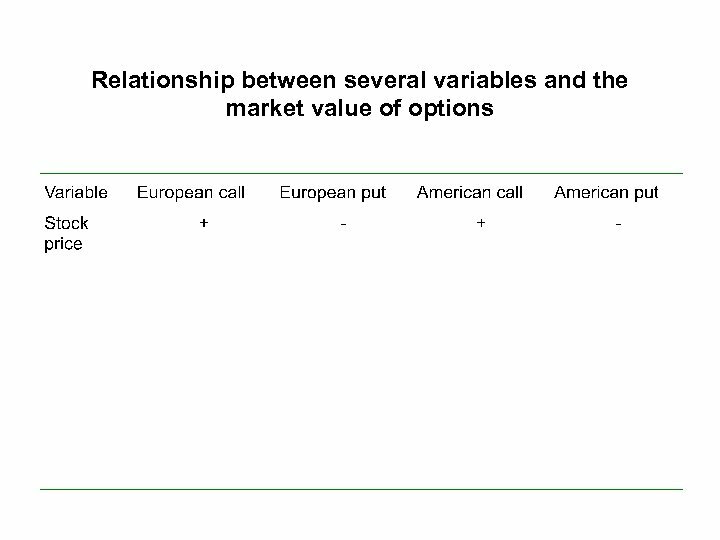 Option valuation basics Like with any other financial asset, the option premium or market value or option price is a function of future expected cash flows. What happens if this relationship is not satisfied? 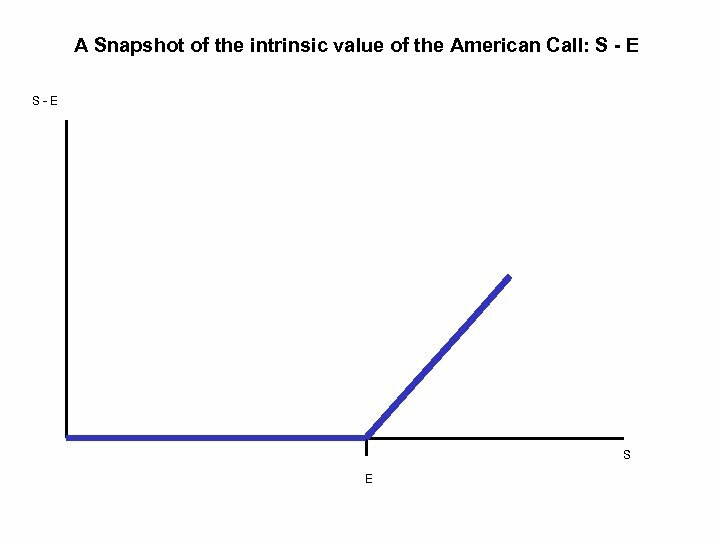 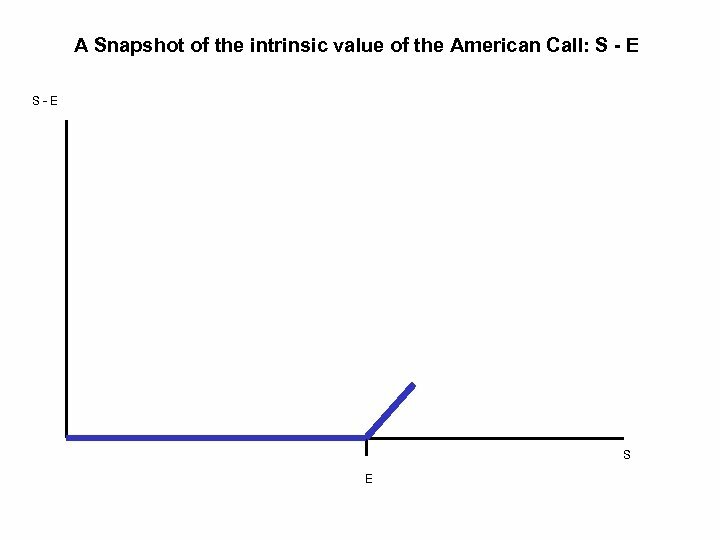 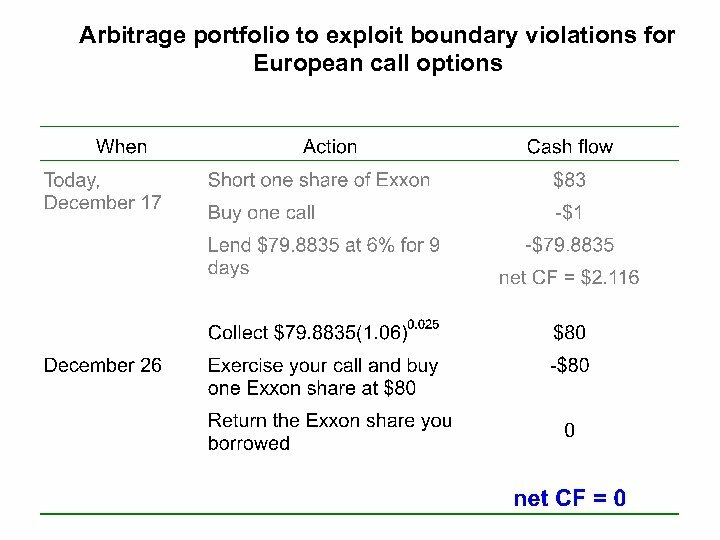 Analysis We have created a riskless portfolio: the terminal cash flow is zero, regardless of the stock price, while the up-front cash flow is positive. 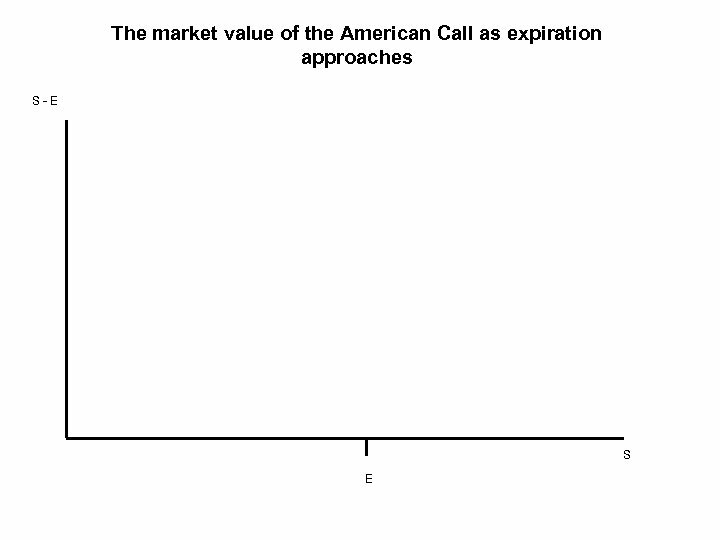 We made $2. 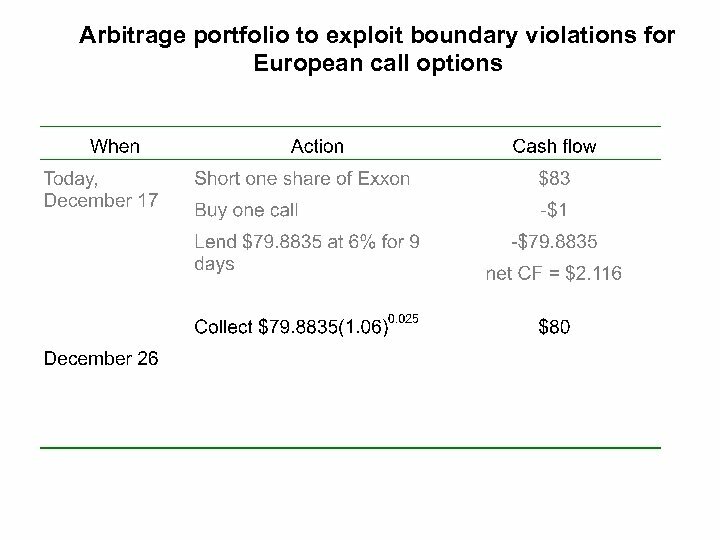 116 in pure arbitrage profits. 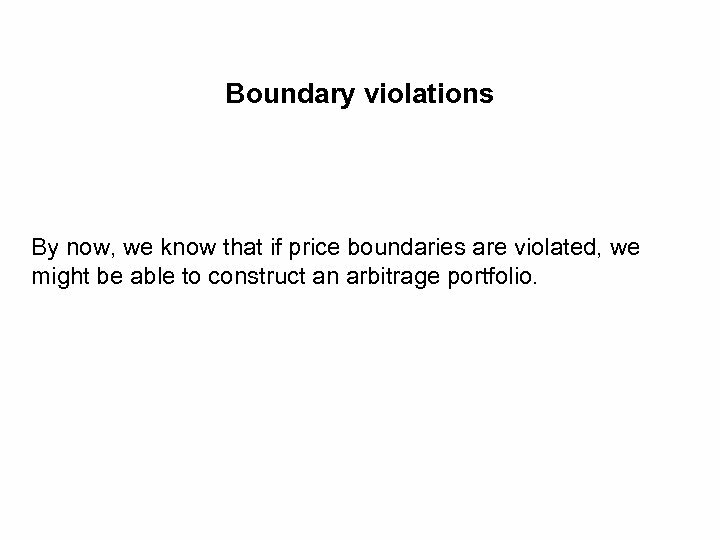 Boundary violations By now, we know that if price boundaries are violated, we might be able to construct an arbitrage portfolio. 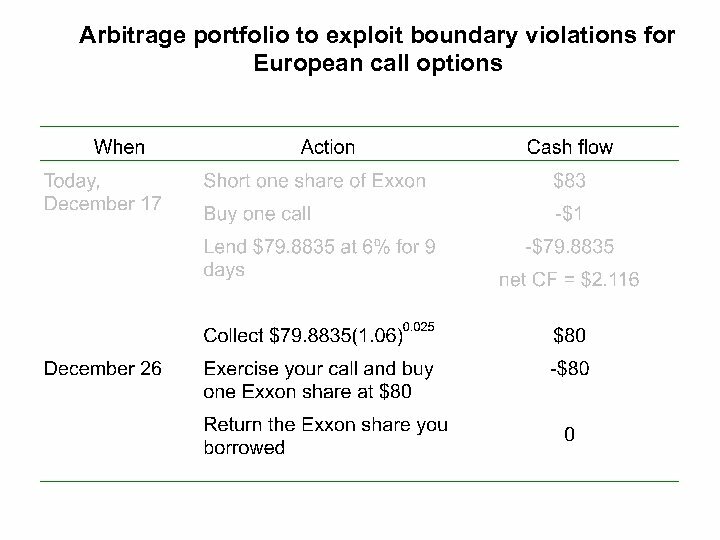 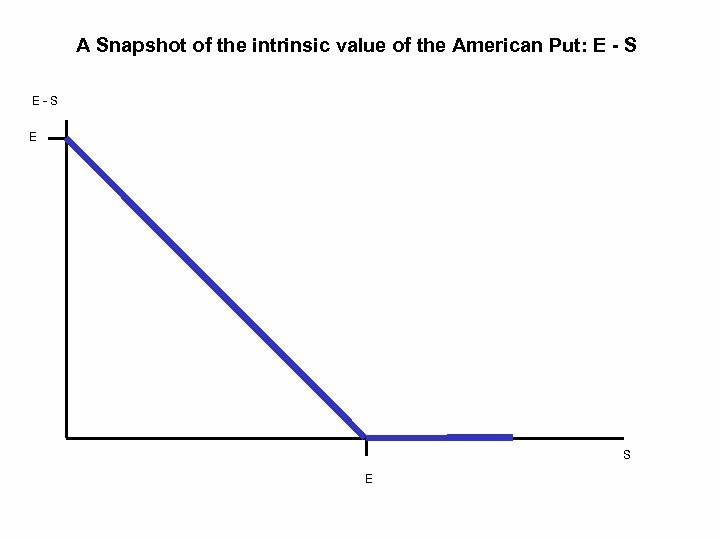 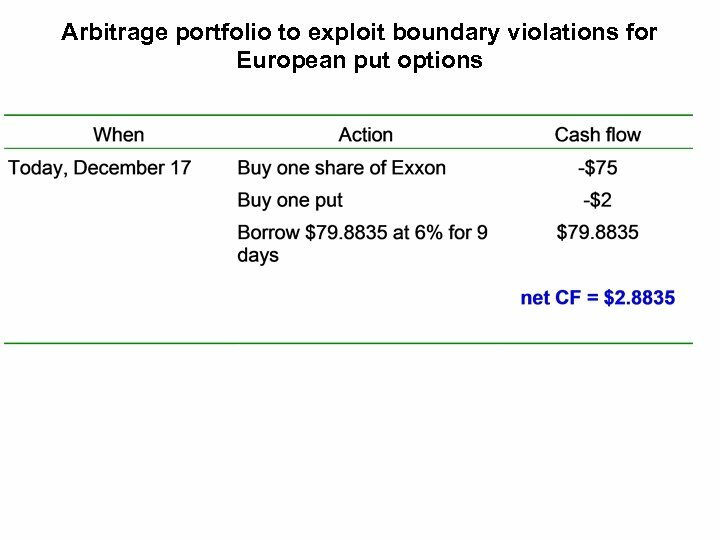 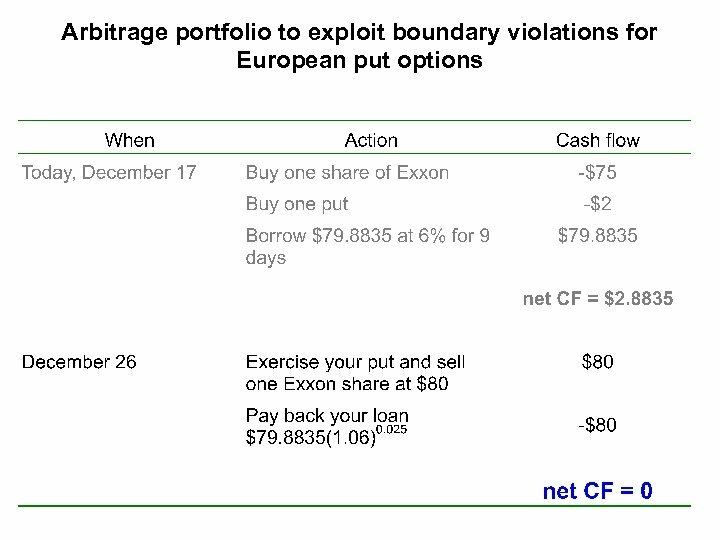 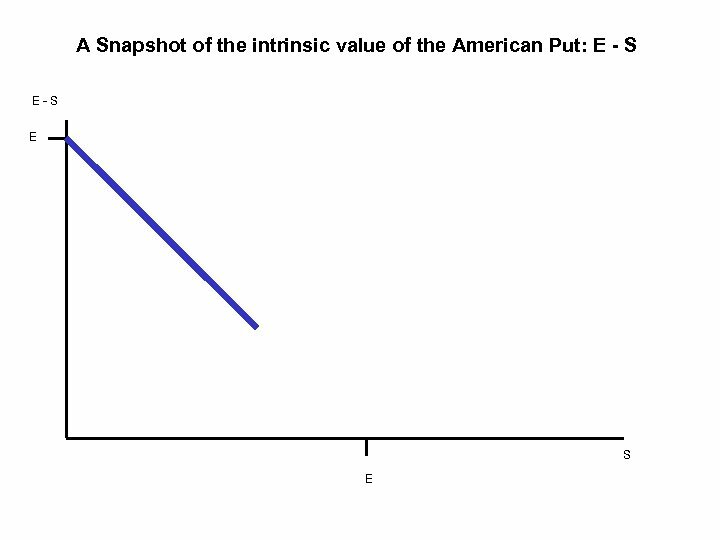 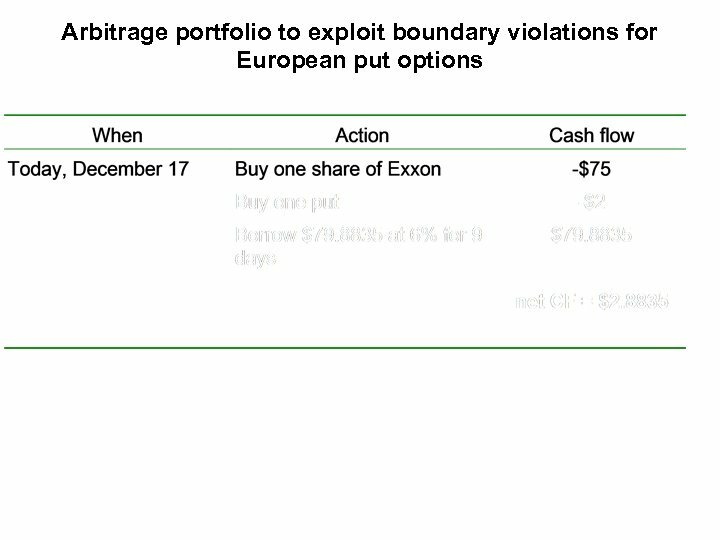 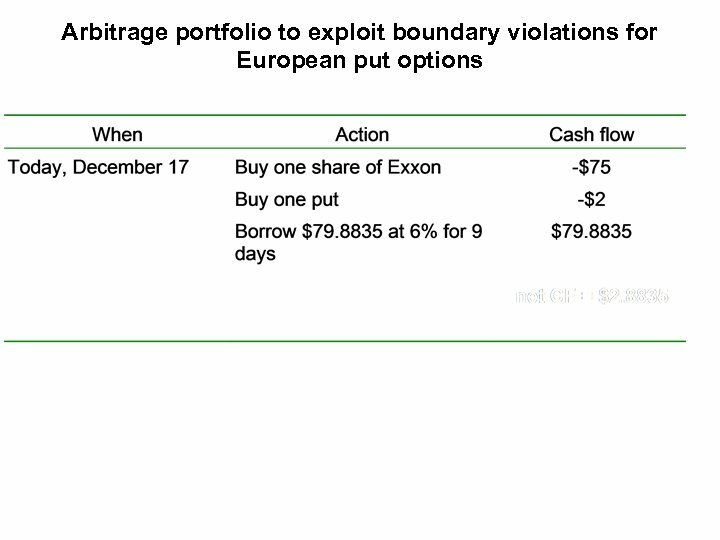 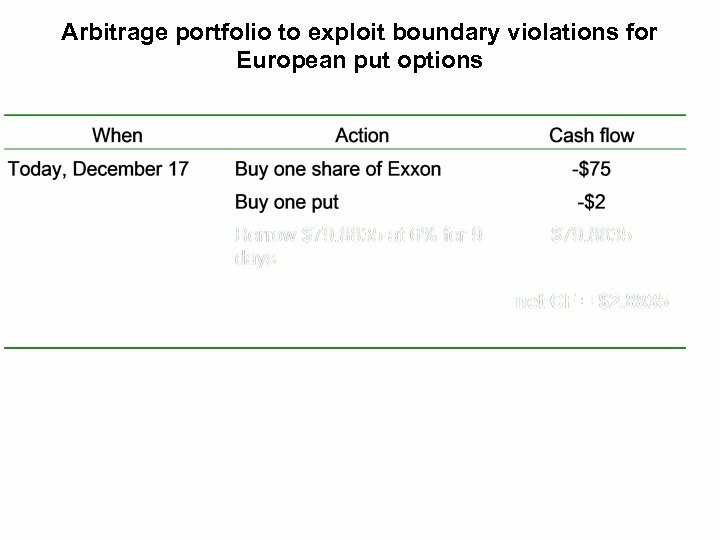 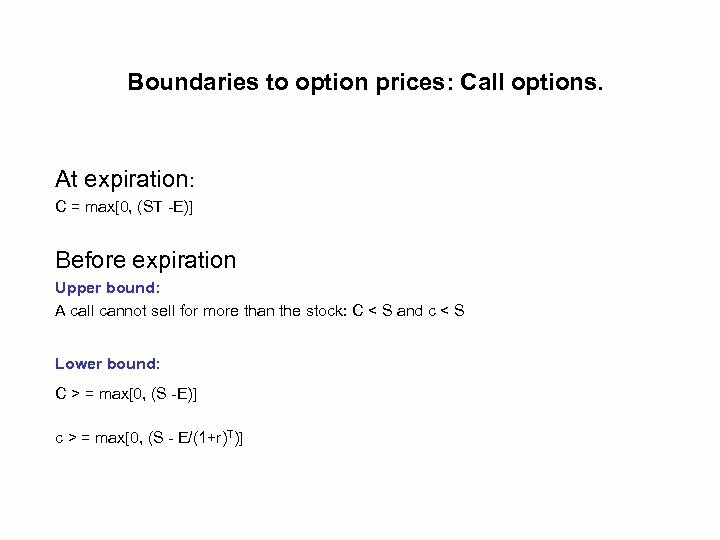 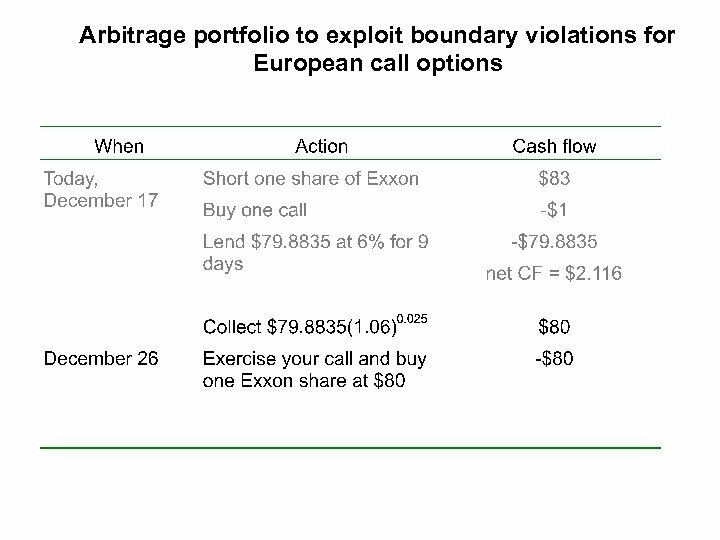 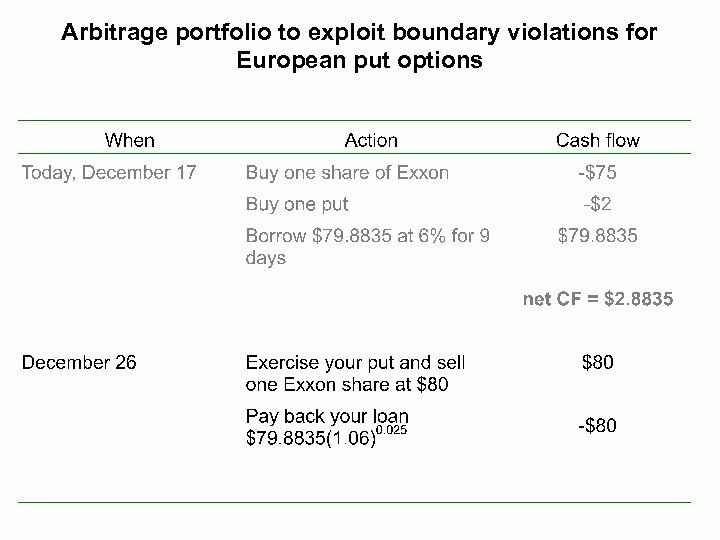 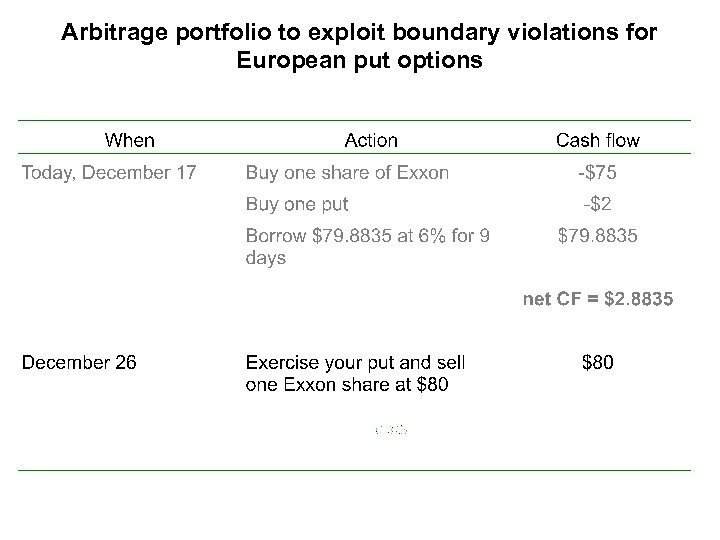 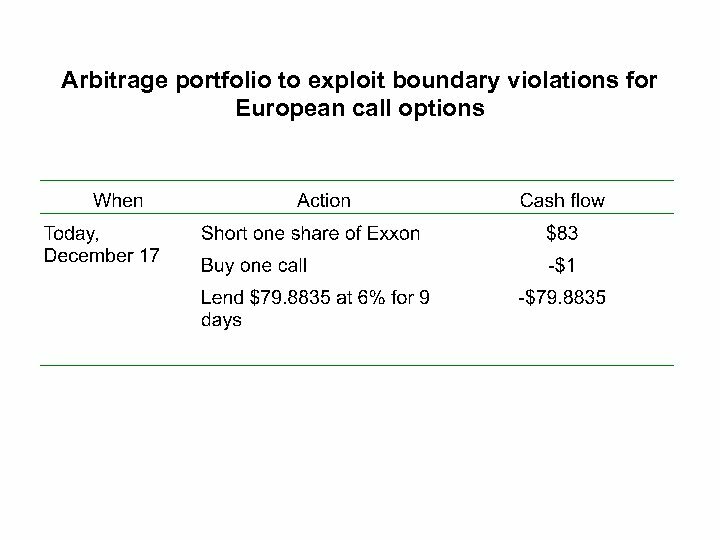 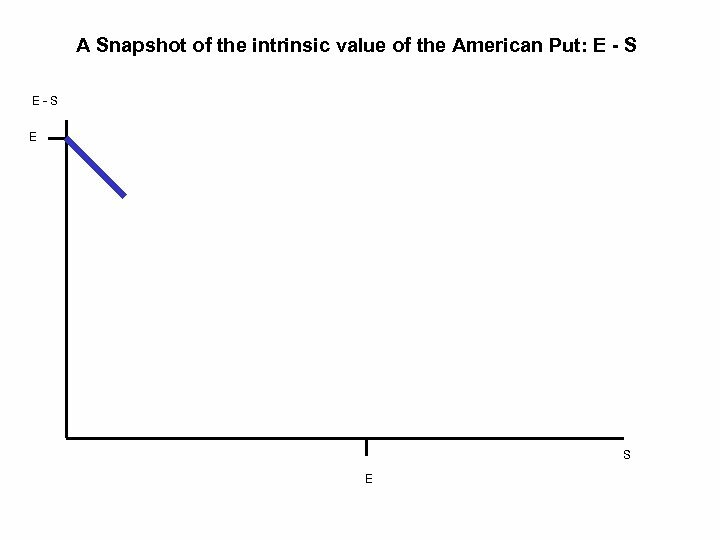 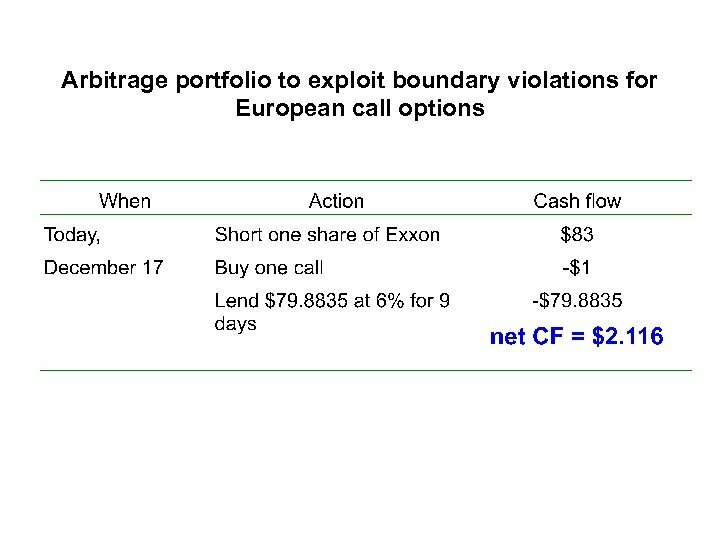 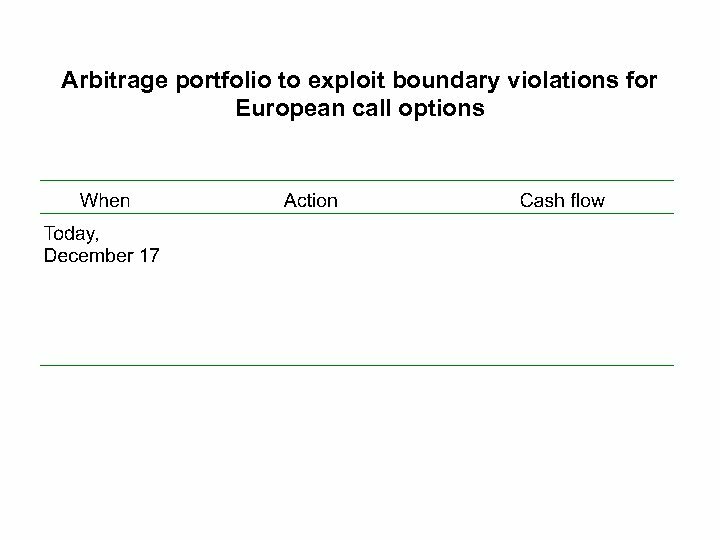 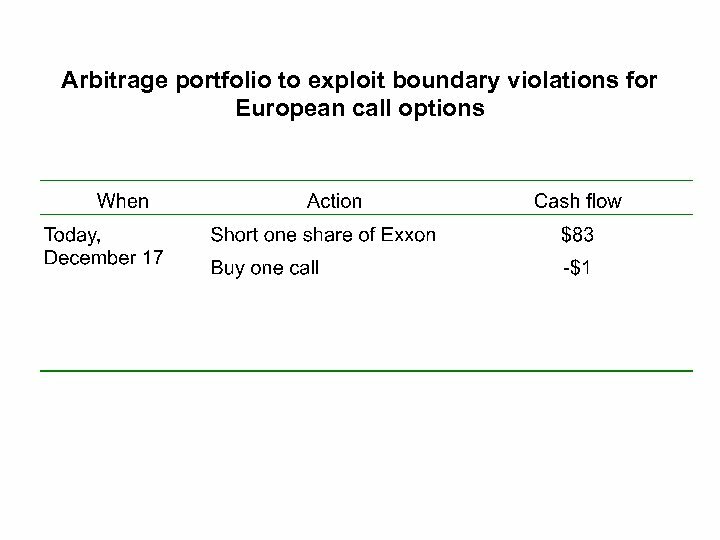 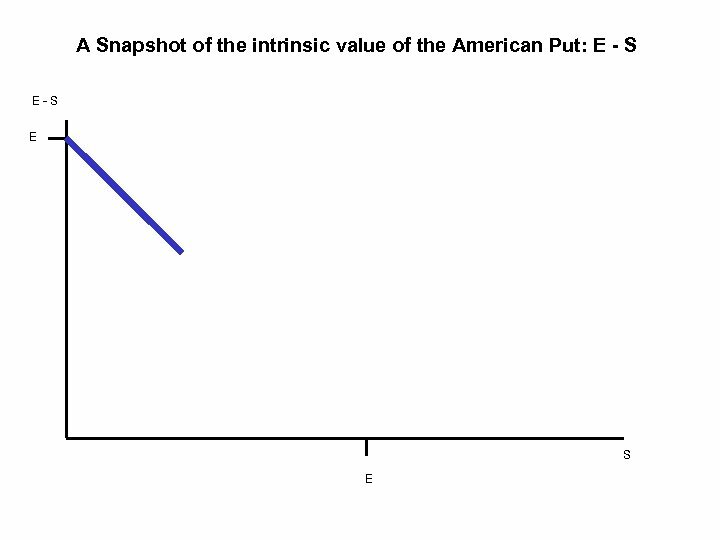 Boundary violations: American put options Assume the Exxon December 26 put struck at $80 sells for $2. 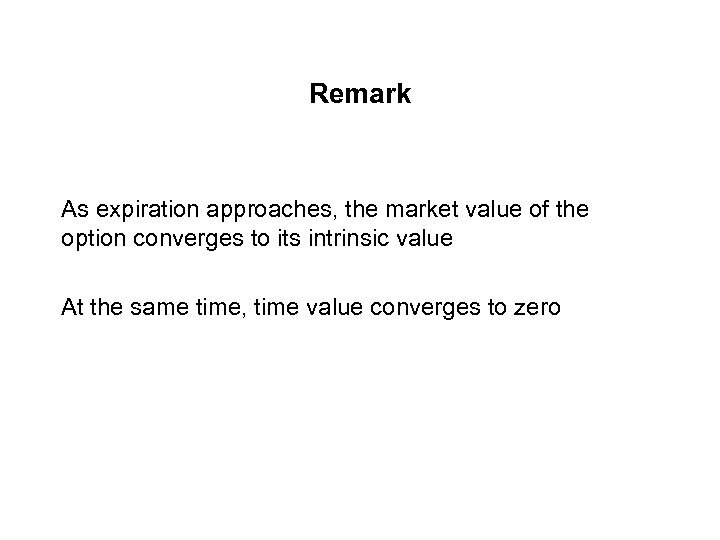 It is now December 17. 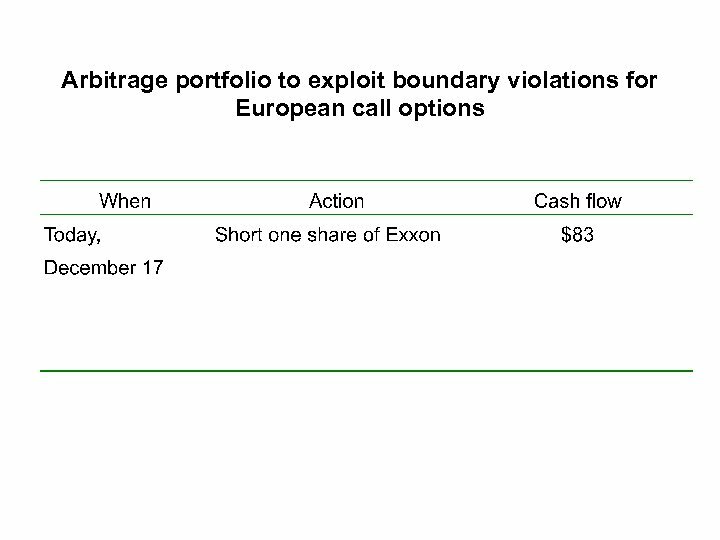 The stock of Exxon is at $75/share. 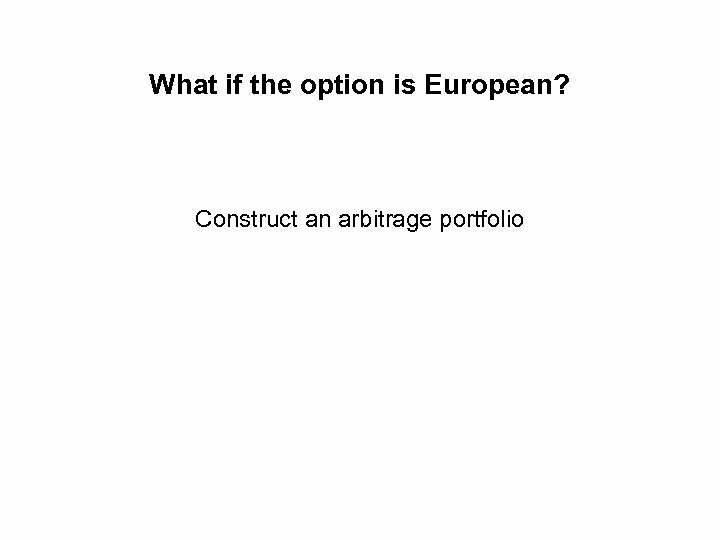 The risk-free rate is 6%. 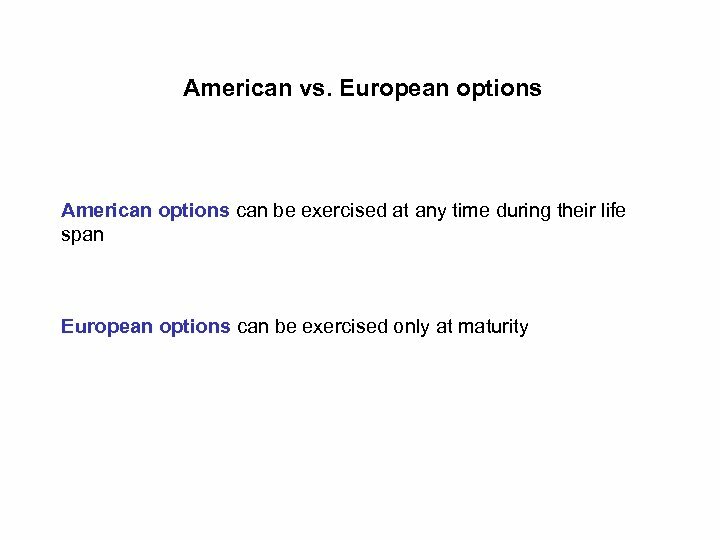 If the option is American, we can buy it for $2 and exercise it. 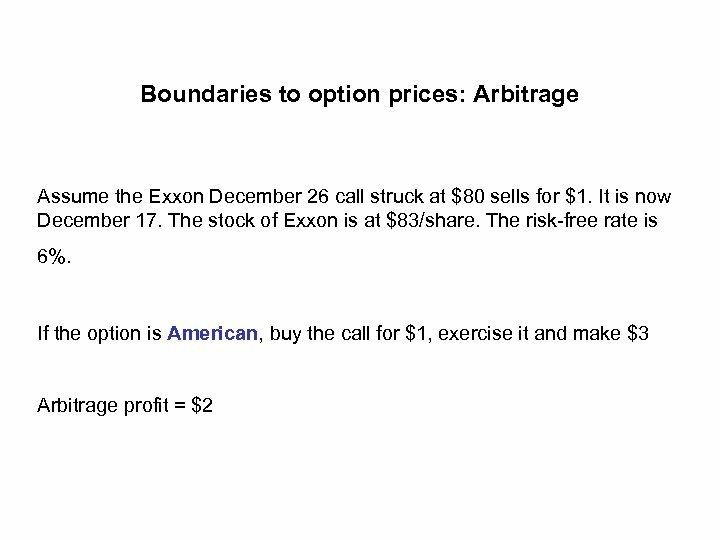 Arbitrage profit = $3. 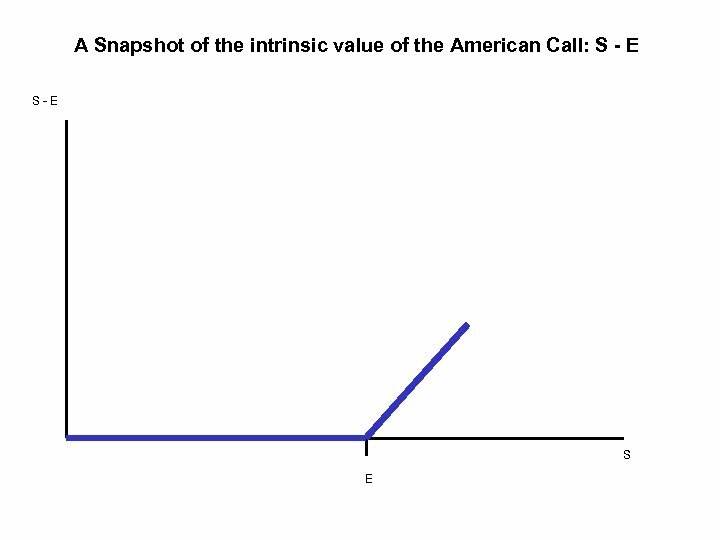 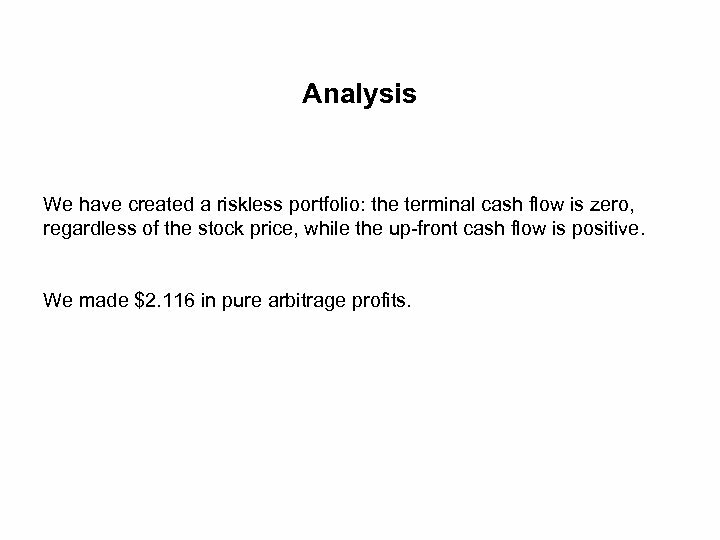 Analysis We have created a riskless portfolio: the terminal cash flow is zero, regardless of the stock price, while the up-front cash flow is positive. 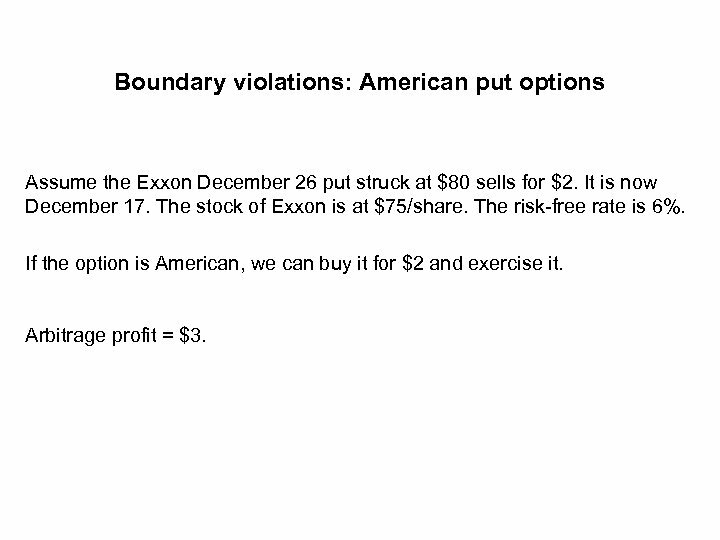 We made $2. 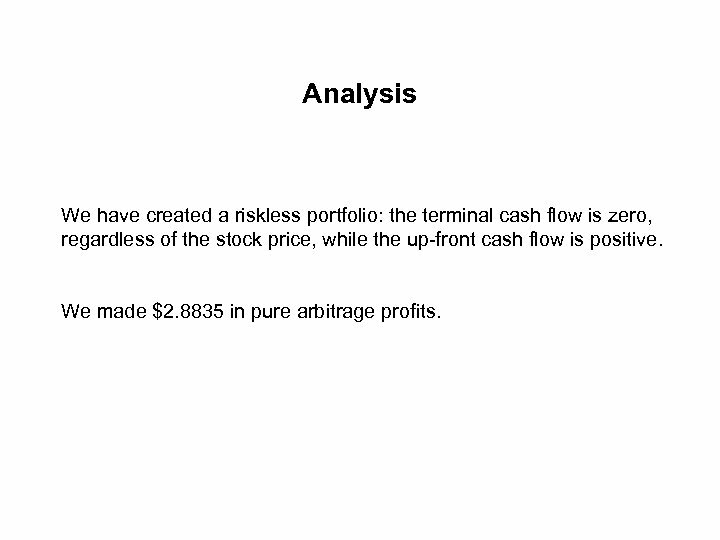 8835 in pure arbitrage profits.